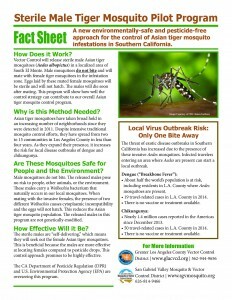 A new environmentally-safe and pesticide-free approach for the control of Asian tiger mosquito infestations in Southern California. 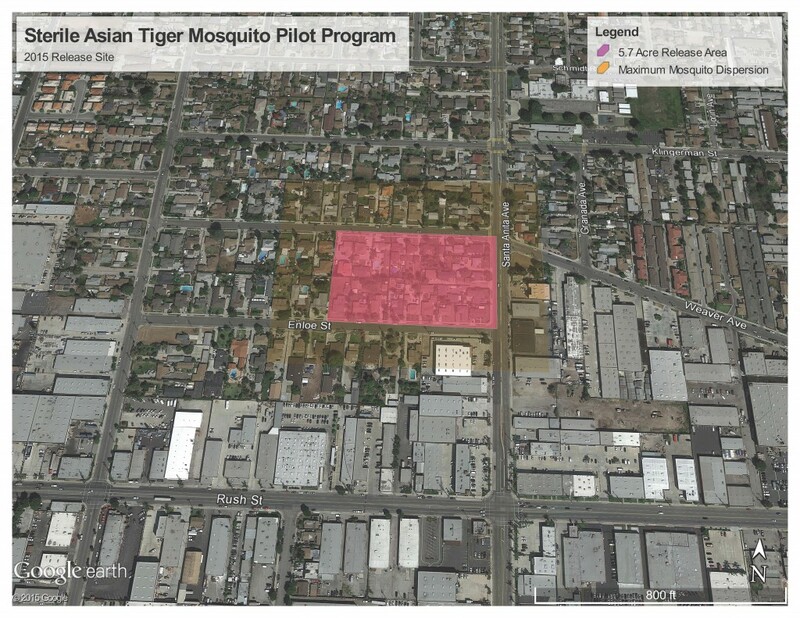 Beginning late June until the end of this season, Vector Control will release sterile male Asian tiger mosquitoes (Aedes albopictus) in a localized area of South El Monte. We will release approximately 5,000 male tiger mosquitoes throughout program area twice weekly. Male mosquitoes do not bite and will mate with female tiger mosquitoes in the infestation zone. Eggs laid by these mated female mosquitoes will be sterile and will not hatch. The males will die soon after mating. This program will show how well the control strategy can contribute to our overall Asian tiger mosquito control program. All residents in, within and immediately adjacent to the pilot program area have been notified by mail or by our staff in the field. If you were not contacted or did not received a letter from us, you are not in the treatment area. We, along with the County of Los Angeles Department of Public Health, presented at a town hall meeting in South El Monte on June 15, 2015. The Asian Tiger Mosquito Health Forum focused on the infestation that affects the residents and our efforts to control the invasive mosquito population. Asian tiger mosquitoes have taken broad hold in an increasing number of neighborhoods since they were detected in 2011. Despite intensive traditional mosquito control efforts, they have spread up to 15 communities in Los Angeles County in less than four years. As they expand their presence, they increase the risk for local disease outbreaks of dengue and chikungunya. The threat of exotic disease outbreaks in Southern California has increased due to the presence of these invasive Aedes mosquitoes. Infected travelers entering an area where Aedes are present can cause a local outbreak. • About half the world’s population is at risk, including residents in L.A. County where Aedes mosquitoes are present. • 32 travel-related cases in L.A. County in 2014. • There is no vaccine or treatment. • Nearly 1.4 million cases reported in the Americas since December 2013. • 50 travel-related cases in L.A. County in 2014. Male mosquitoes do not bite. The released males pose no risk to people, other animals, or the environment. These males carry a Wolbachia bacterium that naturally occurs in our local mosquitoes. When mating with the invasive females, the presence of two different Wolbachia causes cytoplasmic incompatibility. This results in the eggs not hatching, and reduces the Asian tiger mosquito population. The released males in this program are not genetically-modified. The sterile males are “self-delivering,” which means they will seek out the female Asian tiger mosquitoes. This is beneficial because the males are more effective at locating females compared to pesticide drops. The bacteria Wolbachia was first discovered in the 1920s and scientists have thoroughly researched the bacterium’s potential use in mosquito control. This control approach promises to be highly effective.